This is a 7w (35 watt) SoftLite Gold Tint Twisted silicone candle shaped light bulb / lamp with a Bayonet B22 / BC cap by Eveready and comes in a gold tint light with a 10,000h average life. 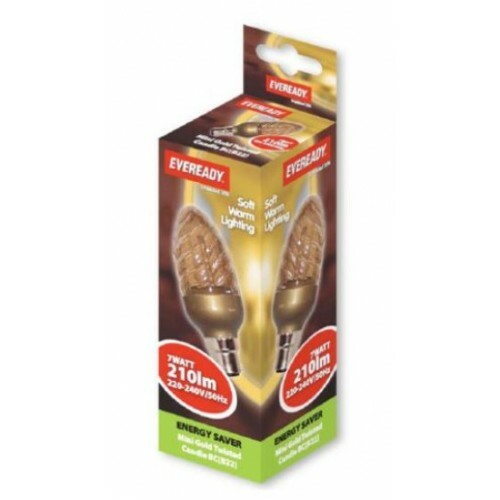 These low energy Eveready bulbs last 10 times longer than a standard incandescent lamp. NB: These light bulbs are not suitable for dimming switches. 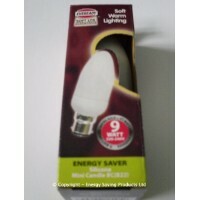 lighting sockets and are an environmentally friendly alternative to standard incandescent lamps. This lamp is recommended for use with fittings allowing free air flow. When used with enclosed fittings or fittings with restricted air flow, the life of the lamp may be significantly reduced. 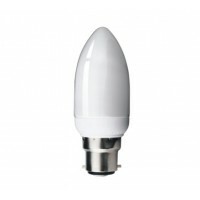 This is a 5W (25W) Bayonet / B22 compact energy saving candle shaped light bulb made by Kosnic, it i.. 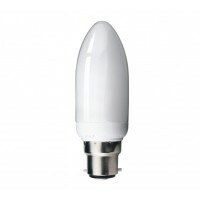 This is a 7W (35-40W) B22 / Bayonet / BC compact energy saving CFL candle shaped light bulb made by .. This is a 9W (40 watt) Bayonet / B22 / BC compact energy saving candle shaped light bulb made by Kos..
9W (40W Equiv) CFL Bayonet Candle Light Bulb This is a 9w (40 watt) Soft Lite Mega silicone cand..